Mangaluru, May 23, 2015 : “The erstwhile BJP government in the state which was rocked by scams and scandals had embarrassed the state in the eyes of the nation. 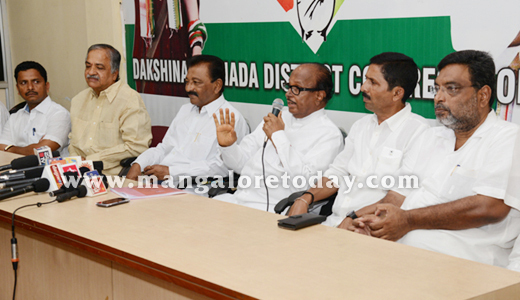 Despite this the BJP leaders are now trying to teach lessons to the Congress which is providing an efficient government in the state,” said senior Congress leader B Janardhan Poojary. Speaking to reporters here on May 23, Saturday, Poojary exuded confidence that the Siddaramaiah Government which has done good work would come to power again and that Siddaramaiah will be the CM of the state for the next 15 years. He also predicted that the BJP will never again come to power in the state in its life time. The people of the state will never forget the misrule of the BJP. Contrarily, the Congress rule led by CM Siddaramaiah has initiated several developmental programmes, he said adding Siddaramaiah is the first ever CM to offer free rice to the poor. He took a dig at BJP leaders including Yeddyurappa for questioning the achievements of the government. Showering praises on Siddaramaiah, Poojary said he takes all ministers into confidence, unlike the BJP rule when differences surfaced among ministers. Also not sparing the Narendra Modi government at the Centre, Poojary slammed Modi over his recent China visit and accused the government of unduly favouring capitalists while neglecting farmers. 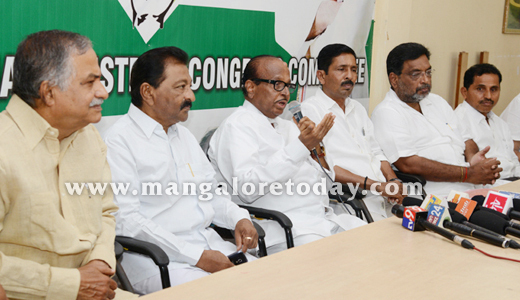 Mahabala Maarla, former mayor, Suresh Ballal, Vijay Kumar Shetty, Harikrishna Bantwal, senior Party leaders were also present at the press meet.